Constant market shifts and changing customer preferences add to the challenge of outperforming your competitors and surpassing stakeholder expectations. But what can be done to steer your organization down the path to greater success? By now, we all know it’s not just historical reporting about the past that will provide the answers needed to drive a business forward. Everyone – from executives and analysts to frontline staff – must have access to insights about the future that will enable them to make the best decisions and take the actions needed to keep their organizations agile. This means the ability to peer into data, explore it, understand it, analyze it and produce insights that provide those aha moments and take actions on it. Such things cannot be done with multiple tools that are rigid, limiting and difficult to use. A new breed of business intelligence is required. Gone are the days when reports looked at singular issues, took possibly days or weeks to create, and required advanced skills to build and even understand. It’s totally unrealistic to think you can run a successful business today if your decision makers are only receiving traditional, static reports delivered to their office desk. These days, huge amounts and varied types of structured and unstructured data pour in from every imaginable source. Users work from virtually everywhere. Because they’re so connected, they expect to get whatever information they need, when they need it, using any device and software they prefer. In such a dynamic environment, today’s business users need access to all types of data, almost instantly. They need the ability to interactively prepare and explore data so they can discover new information and answer new questions – not just about what happened, but why it happened and what will happen next. So sure, there are BI solutions that let you push a button and get some answer. But most likely, you won’t be able to explain how you got the answer or what it means. Which means that answer is of little use. Traditional BI solutions can only provide a picture of what has happened through reports or dashboards. And most have a predefined path of analysis that gives users very little creative freedom to explore new lines of thought. 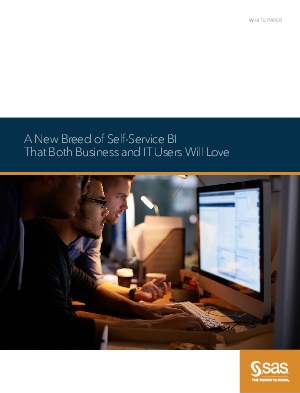 To maintain competitive advantage, your BI solution should allow business users to quickly and easily investigate data to find out why something happened. And go even further to find out what will happen next and determine future outcomes. Only with interactive data exploration and easy-to-understand analytics that are relevant and simple to use can your business users get the fact-based answers needed to take action and create real advantage. Why has this goal been so hard to achieve with traditional approaches and what can be done to improve that situation?